A long reign as it was that of Willem III, a Dutch monarch, deserved a gold bullion coin to match its prestige and that is the 10 Dutch Guilder Willem III gold coin, which was minted between 1875 and 1889. Willem III ruled between 1849 and 1890. 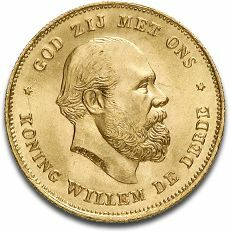 When it comes to the 10 Dutch Guilder Willem III gold coin there are two types of coins minted in two different periods: the first one was only issued in 1875 and the second type of this Dutch bullion gold coin was issued for the rest of the period, between 1876 until the end of the issuing in 1889. The overall weight of the 10 Guilder gold coin facing Willem III is 6.7290 with a purity of 90.00%. the gold weight amounts to 6.06 grams, equivalent with 0.1947 troy ounces of gold. The 10 Dutch Guilder Willem III gold coin also has a diameter of 22 mm. Regarding the design of the two types of 10 Dutch Guilder Willem III gold coin there is not much difference and we are going to present the design for the coins that were issued only in 1875. The obverse of the 10 Dutch Guilder Willem III gold coin depicts, as expected, the bust facing right of Willem III. It is a large portrait that occupies the entire space available on the head side of the coin and the only inscriptions are GOD ZIJ MET ONS after which are engraved two stars that announce the second inscription at the bottom of the coin KONING WILLEM DE DERDE. The two starts separating the two inscriptions on the obverse of the Dutch gold coin are the difference in design between the two types of coins. On the second type the stars are slightly larger. The reverse of the 10 Dutch Guilder Willem III gold coin depicts the Netherlands coat of arms proudly represented by a lion holding a sword in the right hand and arrows in the left hand. At the top of the shield is a crown. At the top of the coin is inscribed the year 1875, then the inscription KONINGRIJK DER NEDERLANDEN and the denomination 10 G separated by the shield. Our website presents investors and collectors with the great opportunity of owning the first type of 10 Dutch Guilder Willem III gold coin, which is characterized by rarity because it was minted by the Dutch government only in 1875. The 10 Dutch Guilder Willem III gold coin comes in Brilliant Uncirculated condition and the mintage from 1875 was estimated at 3,000,000 gold coins. It may seem much for some investors, however the number of years that have passed since the issuing must be taken into consideration. Therefore, considering these facts, the 10 Dutch Guilder Willem III gold coin is a valuable coin that is for now priced really affordably but this situation will not last for long if demand for this coin increases. Netherlands has succeeded in issuing some beautiful and profitable gold coins and the 10 Dutch Guilder Willem III gold coin is definitely one of them.